A man accused of an early-morning convenience store robbery in Gray led police on a brief chase before he was found hiding in a tree. Jarryd M. King, 26, of Warren, was charged with armed robbery and violating conditions of release by the Cumberland County Sheriff’s Office. 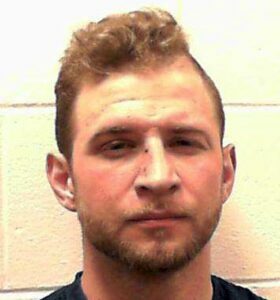 He was charged with six other crimes by the Falmouth Police Department, including creating a police standoff, failing to stop for a police officer, refusing to submit to arrest and criminal mischief. A man with his face covered and a hand in a pocket, as if he had a weapon, entered the Cumberland Farms convenience store on Main Street in Gray around 4:43 a.m. Saturday morning, according to a statement from sheriff’s office Capt. Don Goulet. The man demanded money from the clerk, who complied. The robber then fled south on Route 100 toward Falmouth in a dark-colored four-door coupe, Goulet said. Falmouth police officers saw a vehicle matching that description, but the driver pulled away when they tried to stop the car. A brief chase ended when the car became stuck in the lawn of a home near Leighton Road, according to Falmouth police Lt. Frank Soule. King ran away from the car and into some nearby woods. Police, including a K-9 team from the Westbrook Police Department, found King in a tree a few hundred yards from the road, Soule said. King first refused to come down, but agreed to after a brief negotiation with officers, he said. King was taken to Cumberland County Jail in Portland, and is expected to be arraigned early next week.